Mega Sale! Free Shipping Included! Save 26% on the Aroma Housewares 60-Cup (Cooked) (30-Cup UNCOOKED) Commercial Rice Cooker (ARC-1033E) by Aroma Housewares at Baking Love. MPN: B0002AYZUO. Hurry! Limited time offer. Offer valid only while supplies last. Save an abundance of time and energy with the Aroma 60-Cup (Cooked) Commercial Rice Cooker. Simply add rice and water, press a button and walk away! View More In Rice Cookers - Page 2. 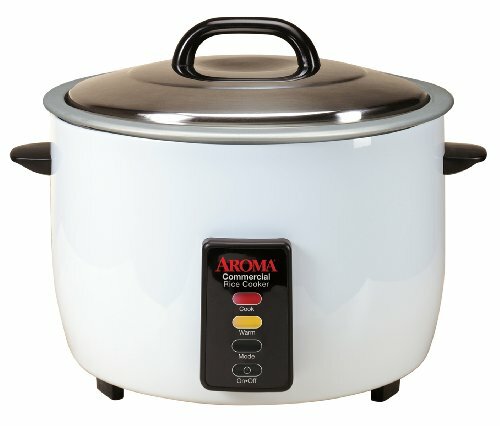 Save an abundance of time and energy with the Aroma 60-Cup (Cooked) Commercial Rice Cooker. Simply add rice and water, press a button and walk away! Aroma takes the "cook' out of cooking rice - leaving you free to work on other things in the kitchen. You won't know how you lived without it! This convenient cooker's generous capacity perfectly cooks up to 60 cups of any variety of rice. It automatically senses when rice is done and switches to Keep-Warm for fresh rice all day. The durable body and heavy-duty stainless steel lid and aluminum cooking pot are designed for continuous use so you can count on batch after batch of flawless rice coming out of your kitchen. Two Rice Measuring Cups and Rice Paddle included.